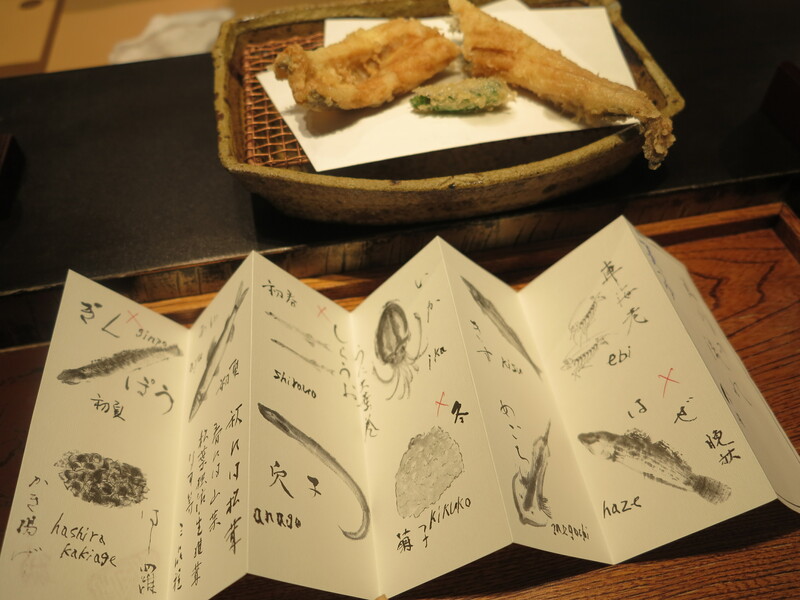 Having read raving reviews about this one Michelin star tempura restaurant, I trekked my way to Monzen-Nakacho for lunch , hoping for some wonderfully fresh seafood prepared by the “legendary” tempura master Tetsuya Saotome. 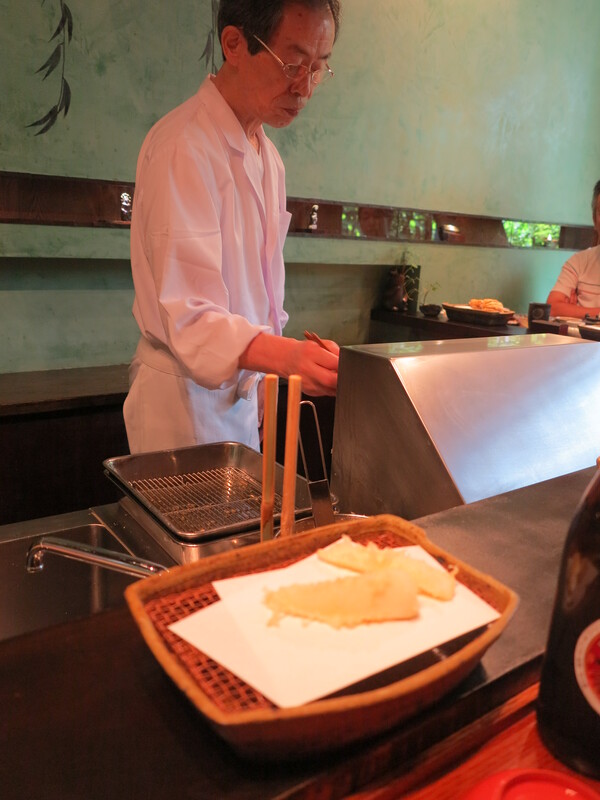 Word has it that chef Saotome serves tempura in the “Edomae” style – meaning that all parts of the meal are made with ingredients that were used in the Edo period. Now what does this mean? Edomae literally translates to “in front of Edo”, “Edo” being the name of Tokyo back in the day when Japan was ruled by the Tokugawa shogunate from 1603 until1868. 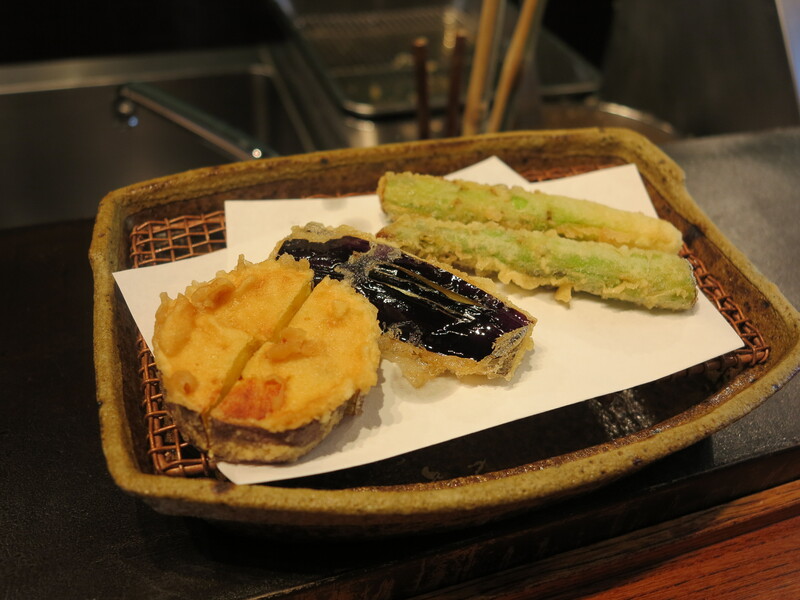 Thus, most of the ingredients used are ones that were obtainable back then in what is now known as Tokyo Bay. 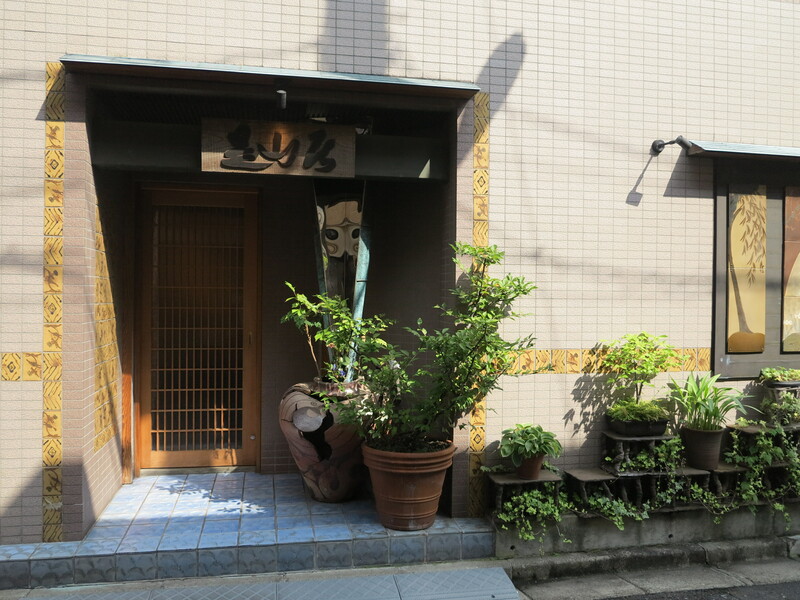 The restaurant is hidden in a small street in a residential area. Unless you are driving with GPS you may need to spend some extra time looking for the place. I was happy when I got there – It was almost 40 degrees that day and I did not want to spend an extra second outdoors :p Upon entering the restaurant I thought to myself – YAY!! Gonna have some yummy tempura. 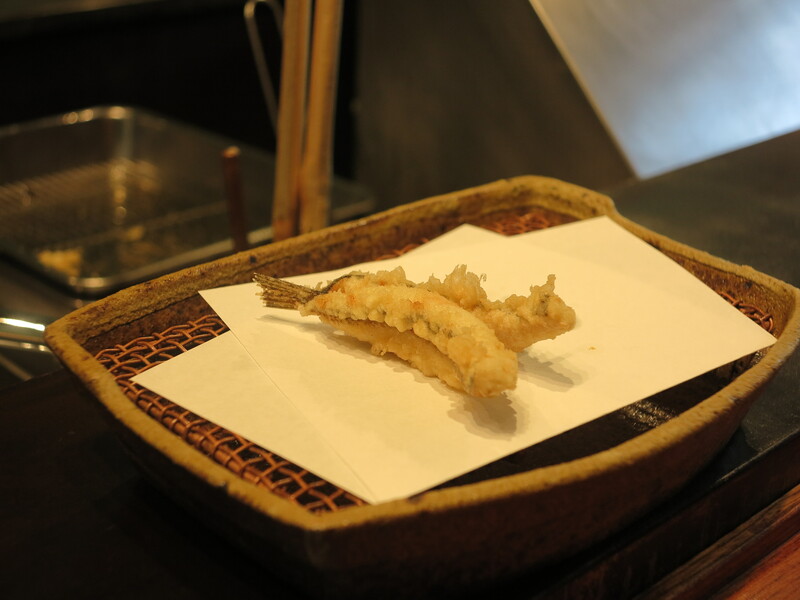 FYI, the original Mikawa tempura store was in Kayabacho where chef Saotome had worked for over 30 years. 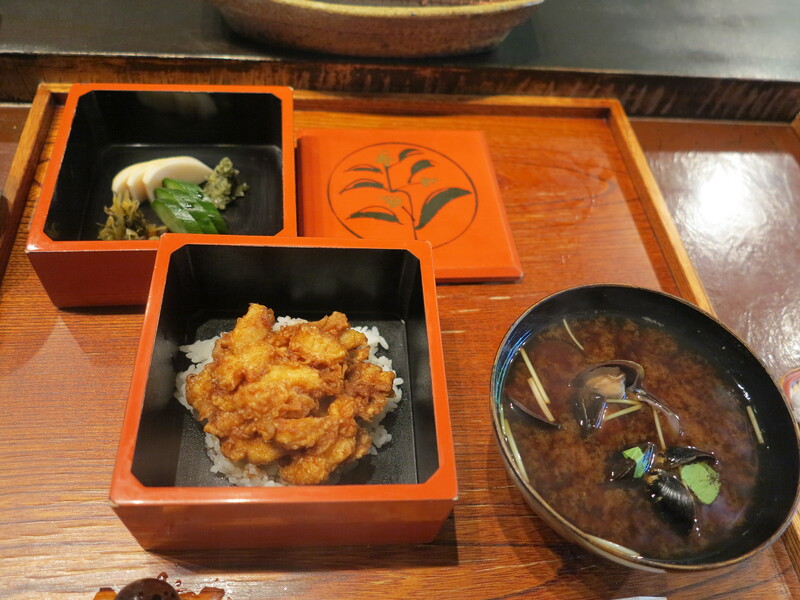 (There is also a branch in Roppongi, but only Saotome’s apprentices work there). 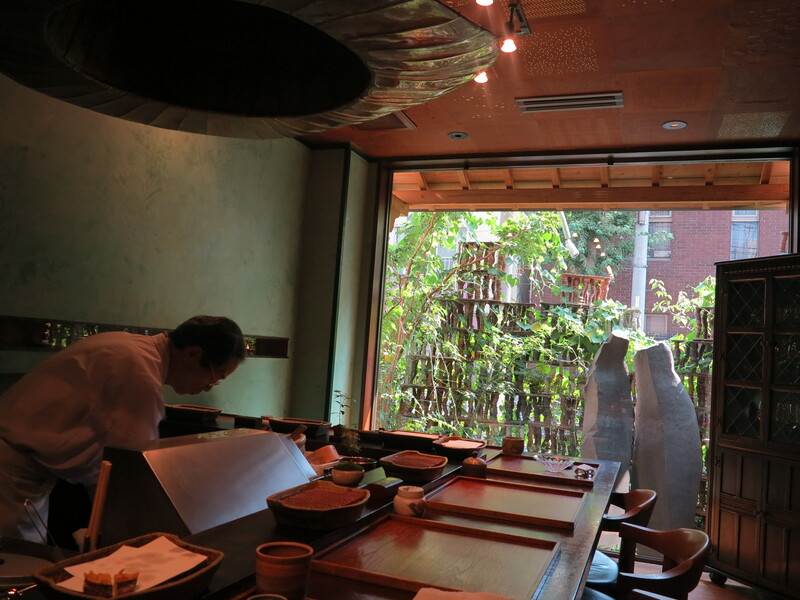 Yes I gathered this information before coming to this restaurant, and knowing of chef Saotome’s veteran experience I was anticipating a lunch worth his name. 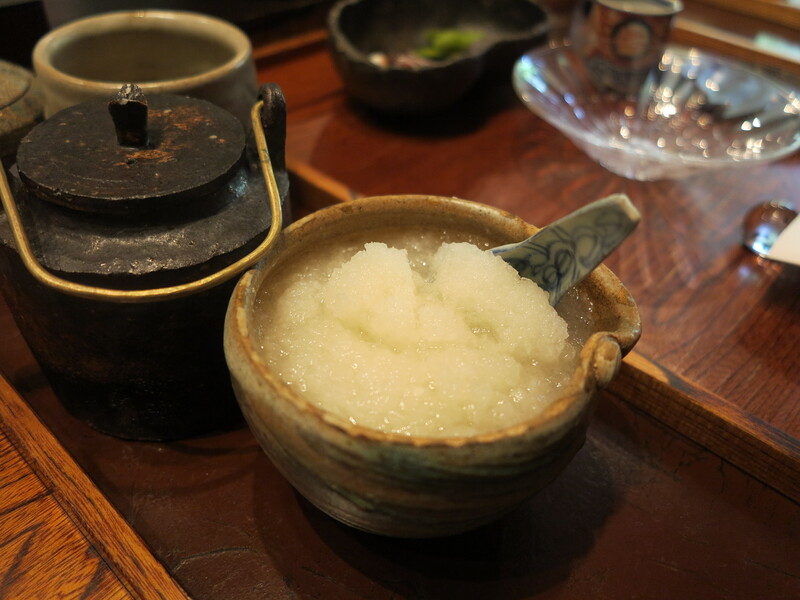 Before getting seated, the table is already laid out, with the daikon oroshi and a green tempura dipping sauce (natsutsuyu) exclusively made for the summer months. The sauce is slightly spicy, slightly bitter and slightly sour. 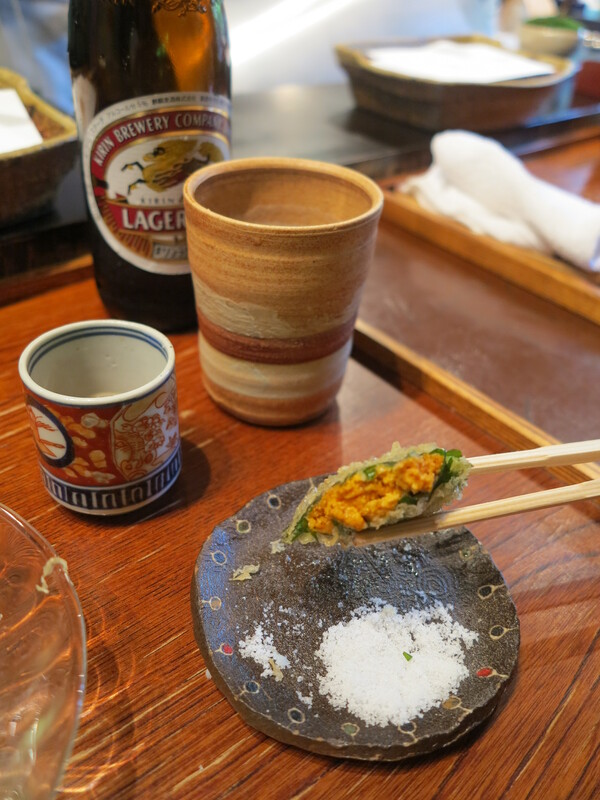 I opted for the 15000 yen Omakase tempura course and a beer. 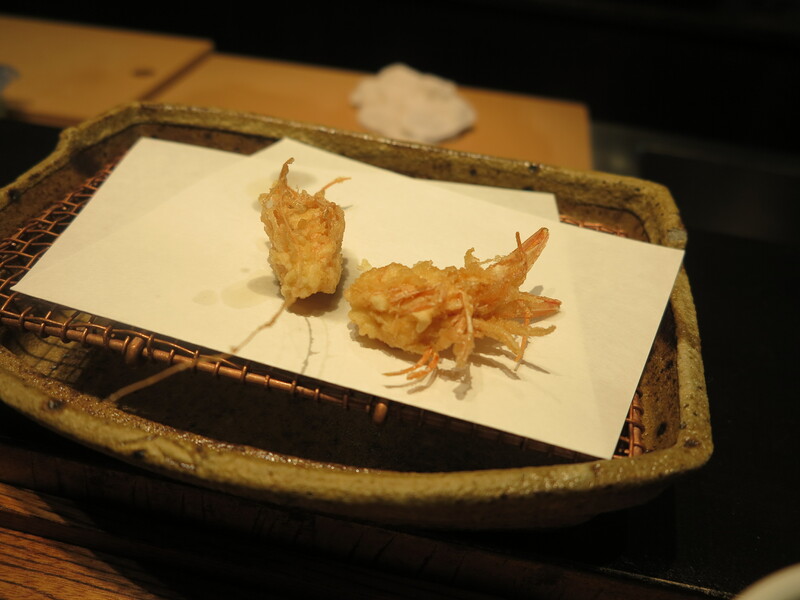 The first thing that came was two pieces of Ebi (shrimp), served one after the other. 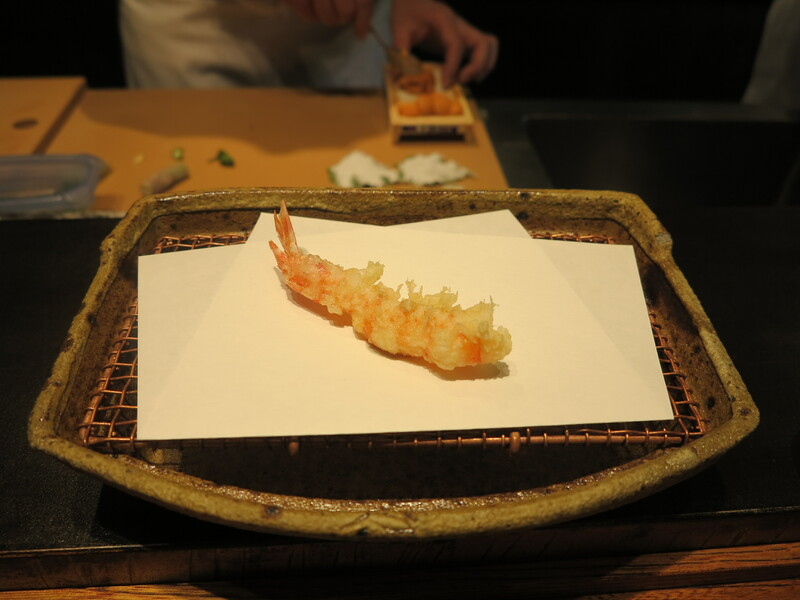 Expecting very good, grease-free, crunchy tempura, I was quite disappointed at my first bite of ebi! It wasn’t oily in general tempura standards but for a restaurant with this name, it was slightly underwhelming. I wondered if it was because the weather was too hot and that I felt greasy myself anyway. So I downed some beer and decided to savour the second piece better. Sadly, I felt like I was just eating more grease. >_< grrr Japanese summers! As expected, the heads of the Ebi came after the Ebi. How did I feel? Ah…. more oil. 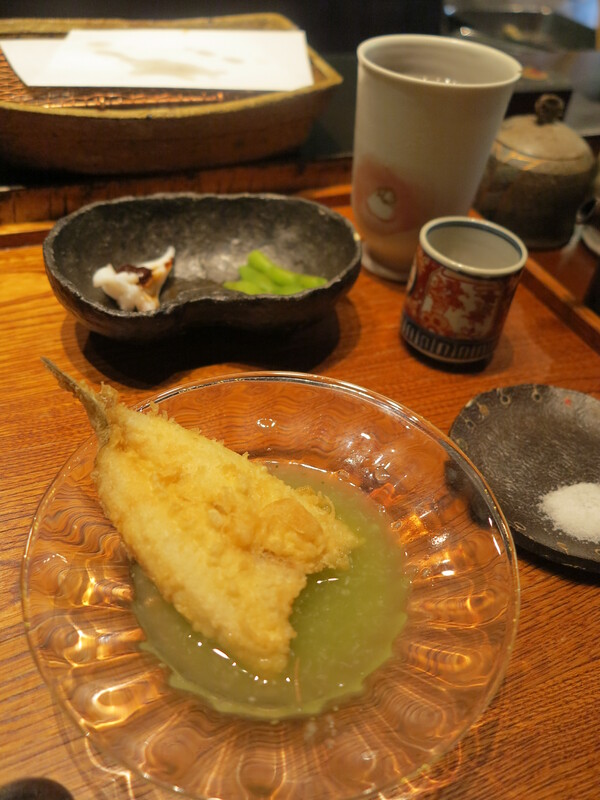 Then came the Kisu (Whiting). 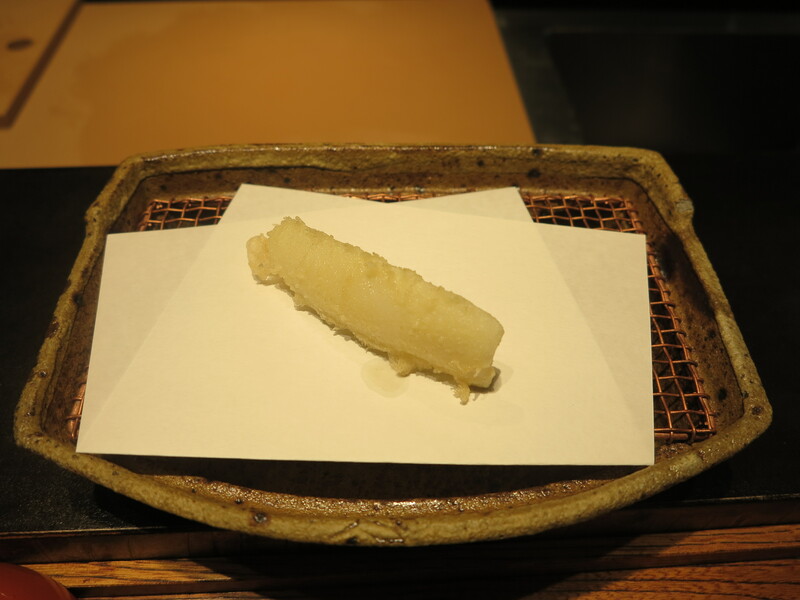 I normally like my tempura with only a dab of salt but because after the ebi and ebi heads I already felt too greasy, I dipped this entire piece into the natsutsuyu, hoping that the acidity would take some of the oily heaviness away. 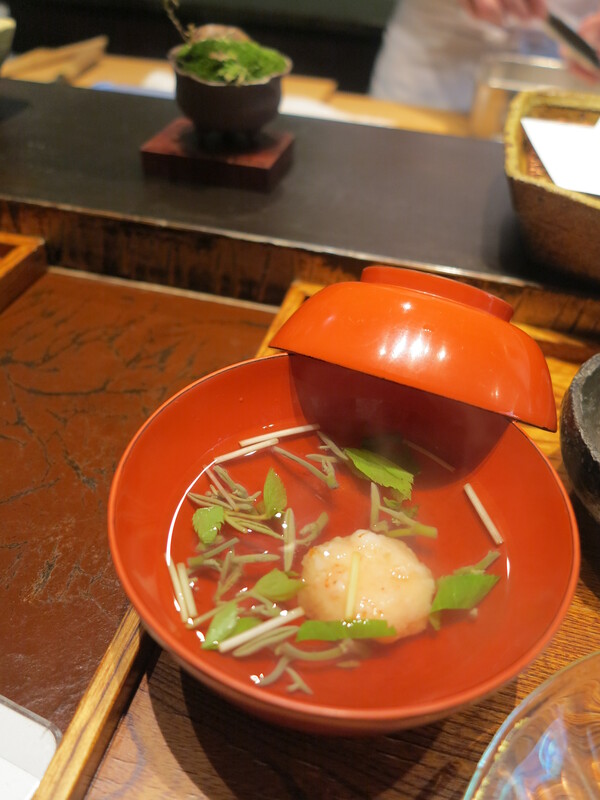 At the same time I was served the Suimono – a clear dashi soup containing one shrimp dumpling. The taste of this was so “standard” I cannot think of any particular words to describe it. 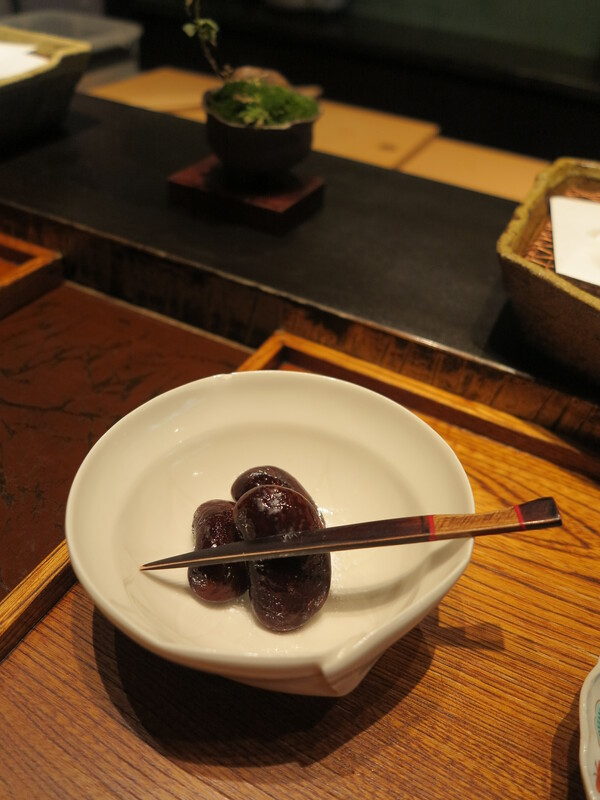 It was not fragrant, nor was it peculiar in any way….. I’d like to blame the 40 degrees celsius outside again…. 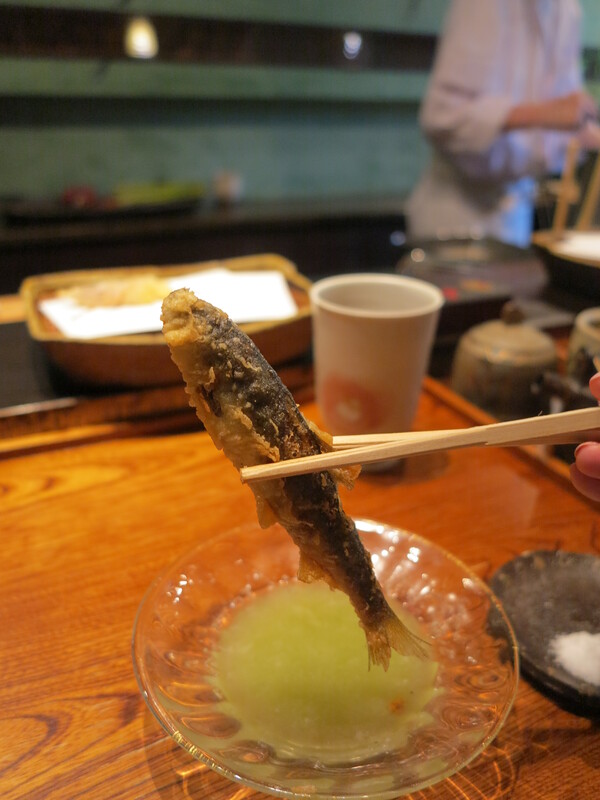 Then came the Ayu (sweetfish). The head was a little bitter but I’d say this was one of the better dishes, mainly because I do not remember what was bad about it. Then I was served the Meguchi. At this point, eating felt a bit like a chore. It wasn’t bad, but I wasn’t able to notice anything good about it. 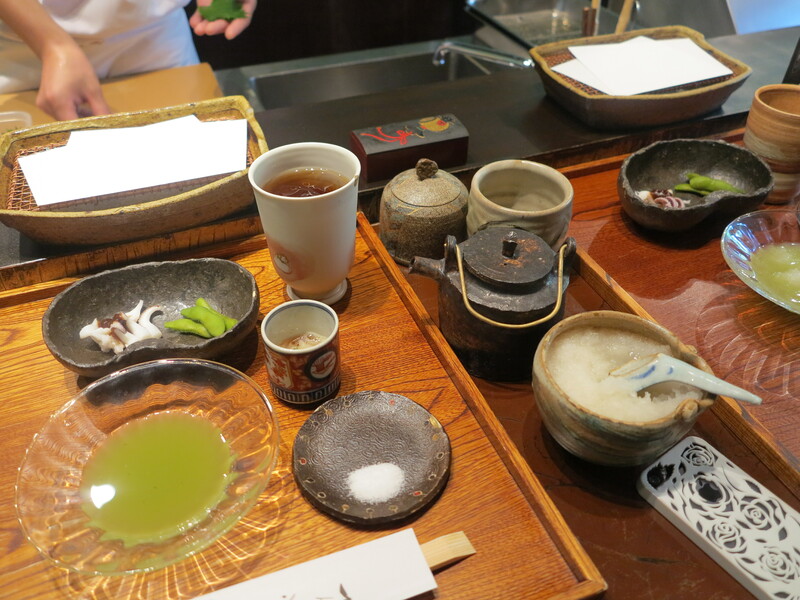 The Anago (sea eel) was probably my favourite course of all. It was crunchy and fresh, though unfortunately by this time I was getting very full and was not able to enjoy this piece to the fullest. Had some veggies too – Sweet potato, Aubergines and Asparagus. 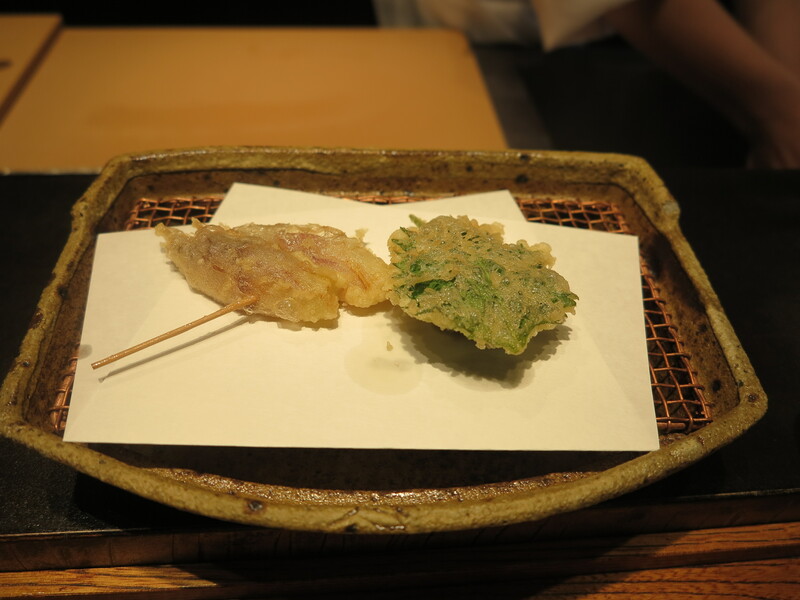 The sweet potato was nice, but it isn’t too hard to find decent sweet potato tempura. The aubergine was not worth mentioning. 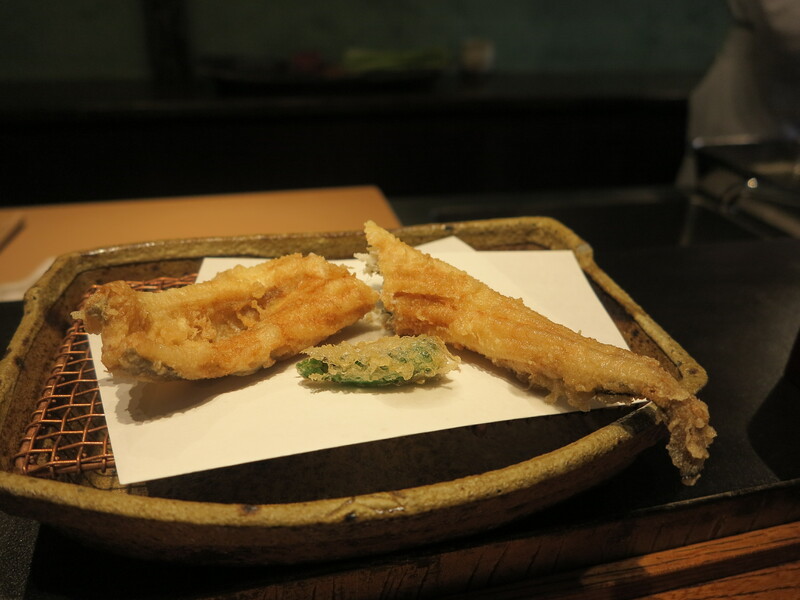 Most disappointingly, the asparagus was too fibre-y – not the sweet juicy asparagus I expected from a top-notch tempura-ya! Towards the end of the meal I was given a choice of either a kaibashira kakiage (scallop kakiage) on rice with miso soup or the same thing in an ochazuke (tea-based soup rice). My mom and I went for one of each. I was getting tired at this point and just wanted to finish the meal. A few pieces of sweet beans came as dessert at the end of this uneventful meal. So… in conclusion… would I do this again? … No. Just to be fair I would give elderly Chef Saotome the benefit of doubt – perhaps this was just a very unfortunate, bad day. All of us have bad days. 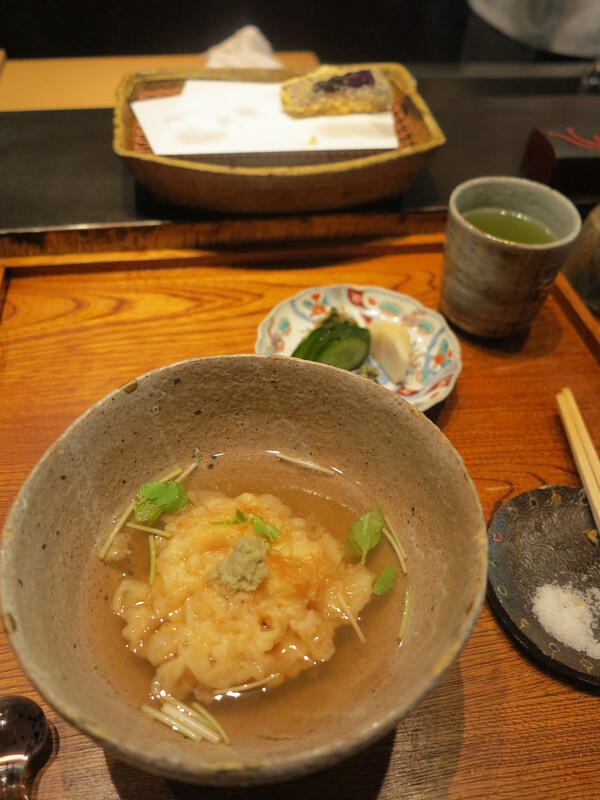 But given the fact that there are plenty of other top-notch tempura-yas in the city, I shall not risk having yet another mind-numbing meal instead of trying out a new place.